Here is a great way for your church, club, school or other organization to purchase the canning jars you need for your next fund raising event. 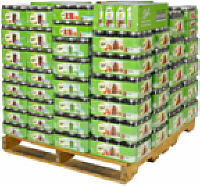 Ball Assorted Half Pallets give you the most popular jars, lids and bands in just the right quantities. These half pallets are also great for families or friends to obtain the jars they need for summer canning without traveling all over town. Caps, lids, and rings are interchangeable with Ball or Kerr mason jars. All Jars come with Lids and Bands. This half pallet contains a total of 86 cases.